OK listeners, how would YOU turn on the water? Latte: I'm still working on: Twisted Flower Socks, SPAKAL Sweater (Bright and Sunny), Ben's Mitts and I cast on a Wingspan shawl out of Mini Mochi. Flavor of the Day: I've been wearing lots of knitted items: Ptarmigan Cowl, Cassidy, Ada Lovelace Anklets, Vine Yoke Cardi, Clapotis, Klieo, Tribute socks, Summer sliding socks, Stricken socks, Uptown Girl socks and Elektra. Brewing: I've been thinking about the adage "Form follows function." After staying in a hotel room where the bathroom had been renovated into all squares. The form and function of the bathroom "appliances" seemed to have nothing to do with each other. This doesn't work! It doesn't work in knitting and it doesn't seem to work in home furnishings either. What's going on here? What do you think? Stir: I did some spinning at Madrona (of course) which I will detail more in a later episode. I did, however, acquire some fiber, namely: Crown Mountain Farms Superwash Merino in the color way Season of the Witch, Opulent Fibers 70% merino, 30% Tussah silk in a fire engine red and Woolgatherings Organic Polwarth in the colors of spring crocuses. I also got some undyed Jacob fiber, Merino Cross and BFL/silk, all from Crown Mountain. Mary, my Fairy Godmother, gave me some Abstract Fiber 50/50 Cashmere/Silk in the color Malificent - so named by Laura the Joy of Cooking Fairy. At Madrona, I also purchased a wee bit of yarn. I frogged my Color Affection/Affliction. I had a look at it and it just didn't appeal to me anymore. I will knit it again, with a different third yarn. Latte: Progress is being made on the SPAKAL sweater and also on Odelia. Grande: I finished the Tribute Socks. 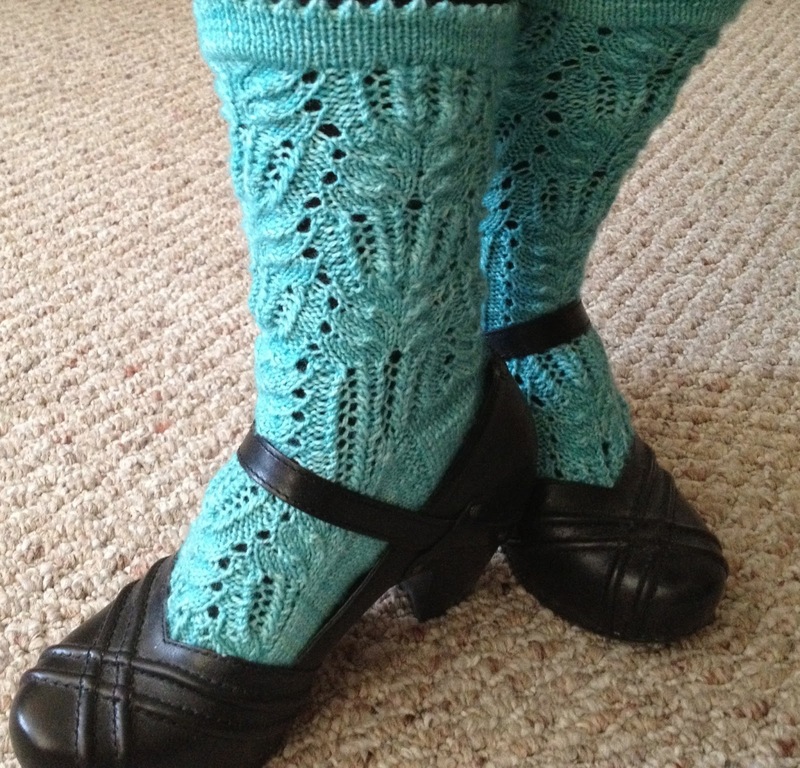 They're knit from Hazel Knits Artisan Sock in Seaglass and they're super cushy and fun to wear. Brewing: I gave away two pairs of socks recently, Marilinda and Twisted Flower, both by Cookie A. These socks were simply too big for me! 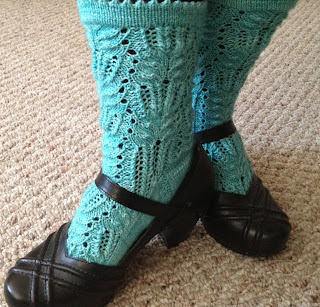 This fact has propelled me into my own sock design, but left me with a question about using smaller needles than size 0, or other ways of knitting my socks just a bit smaller than they've been turning out. I've also become enamored of the Wingspan shawl. Sparkli happened to have the exact extra ball of yarn that I need to create one! Twitter can facilitate minor miracles. Flavor of the Day: This past week I wore: Rocky Coast Cardigan, Gable Mitts, Pogona, Clapotis, Stricken, Uptown Girl, Berlin Muster, My Heart Beets 4 U and Summer Sliding Socks. Chai: Abby went to the Cheeseboard Collective for the first time and had fabulous thin crust pizza. Yum! A Story: I talk about my first knitting project, and "relearning" to knit from Barbara Walker's Learn to Knit Afghan Book which, by the way is still in print! Sofa: I have abandoned the idea of seeing 2 of the Oscar nominated films: Amour and Beasts of the Southern Wild. I have been enjoying catching up on The Walking Dead and I'm thrilled about the new season of Smash. Events: I will be at Madrona! Ping me if you'd like to get together.